If you’re keen on slashing the amount of money you spend on gasoline every week, a three-pronged approach will deliver optimum results. You’ll want to 1) maximize your efficiency behind the wheel, 2) minimize the number of miles you travel, and 3) pay the least amount (net) per gallon. The bulk of our time here at MPGomatic is spent focusing on driving efficiency. For the sake of testing consistency, we try to stick with the same gas station, whenever possible. As such, shopping for price isn’t part of our standard modus operandi. So to get the word on getting the best prices, we called in a pro, Andrew Schrage, the co-owner of Money Crashers Personal Finance to learn the tactics he uses to get the best prices. MPG: Gas prices are already flirting with five dollars a gallon in some parts of the country. What are you doing to fight back? Andrew: To fight back against the rising gas prices – or, at least, to cope with them – I consistently identify as many ways as possible that I can save money on gas. I’ve consolidated my errands, as I try to never go out for just one thing. I am attempting to drive slower on the freeway and I keep up-to-date on all car maintenance, including tune-ups, using the correct motor oil, and properly inflating my tires. MPG: Do you drive an alternative fuel vehicle (or have you considered one)? Andrew: I considered purchasing a hybrid car but haven’t yet pulled the trigger. I still think they’re not quite as cost effective as they could be, but they’re getting there. MPG: Do you believe that the President has the ability to lower gasoline prices? Andrew: In my opinion, there are many things that influence gas prices. The main factor is worldwide demand and supply, which obviously, President Obama has little control over. However, I think when he says there are no quick fixes or silver bullets to halt runaway prices at the pump, he’s just trying to pass the buck. The job of president is difficult, and I feel it’s his responsibility to do whatever he can to reduce gas prices – or, at least, try to take a more active approach to curb the costs. Having said that, I think that we the American people can do our part by simply using less gas. MPG: With credit cards, folks can typically pay more at the pump. The gasoline companies provide various schemes to offset this. The big question is: do you actually pay less in the long run? Andrew: It is illegal for gas stations to charge more for a gallon of gas when paid with a credit card, but it’s legal for them to give a discount to cash customers. How’s that for a loophole? In some cases, consumers are being charged up to a dollar more when paying with credit. And often, the advertised price is the cash price. People won’t know they’re being charged more until they actually begin pumping gas. If the price difference for paying with credit is only a few cents, I’d still suggest paying with credit, especially if you have robust cash back rewards for gas purchases. If not, just pay cash. MPG: Locking into one gasoline companies credit card may result in you paying more, because you’re not shopping for price. Is a gas company credit card a good idea? Andrew: Cash back rebate programs with gas company credit cards are typically rife with exclusions and limitations, and for the most part, you can get a better return by going with a general purpose credit card with stellar cash back rewards. The Chase Freedom Visa, for example, offers 5% cash back on gas for two quarters out of the year, and features a variety of additional benefits. MPG: Common sense says that carrying a balance will quickly negate any savings … to avoid this, you should aim to keep a zero balance and pay off the card every month. Andrew: This is true for your entire financial picture. People who view credit card debt as a fixed expense in their lives just aren’t thinking clearly. A quick rule to keep in mind regarding credit card purchases is this: if you can’t afford to pay it off by the end of the month, then you just can’t afford it. MPG: Is it worth it to drive out of the way for cheap gasoline? The extra driving seems like an added expense that can easily eat up whatever great deals you might turn up. Andrew: This depends on the savings you can find, the size of your gas tank, and how far you must travel. If you use a website like GasBuddy, which is one of the best iPhone apps for cheap gas, you can often find cheap gas nearby. Let’s say your car has a 13-gallon tank, and five miles away a gas station is charging $0.10 per gallon cheaper than what you pay at your local station. Your savings on a fill-up would be $1.30. If your car gets 30 miles per gallon, it will cost you $1.33 for the 10 mile round trip. Therefore, it does not make financial sense to drive out of your way for cheaper gas in this scenario. Exxon Mobile Speedpass is offering $0.15 off per gallon (up to 100 gallons) now through 5/31/12. Sign up is free and using the Key Tag at the pump is more convenient than a credit card. 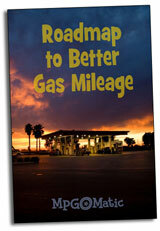 Depending on where you live- another great way to save on gas is through grocery store gas rewards programs. The more you spend in the grocery store, the more you can save on gas.